Salerno is ideally located, right on the Amalfi coast, with beautiful towns such as Sorrento, Positano and Amalfi just a short drive way. Salerno itself has escaped mass tourism, and remains authentically Italian, with a beautiful historic centre, as well as long seafront promenade with magnificent views over the Gulf of Salerno. Due to Salerno’s marvellous year-round climate, people here enjoy an outdoor lifestyle which this beautiful weather makes possible. Where better to learn Italian than in somewhere so Italian, in such a beautiful location and virtually untouched by mass tourism? Our Italian language school in Salerno is located in the centre of the city, on the seafront promenade and on one of the most beautiful streets in Salerno. The school is in an antique ‘Palazzo’, a magnificent and well preserved historic building, giving several of the classrooms incredible sea views over the Gulf of Salerno. The school is comprised of 14 classrooms, a multimedia room with 8 computers and internet access, a cinema room and a library with a wide selection of language resources. 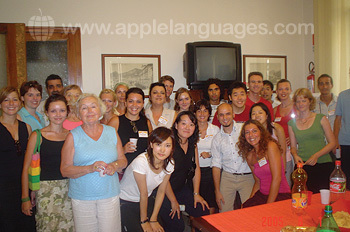 You can learn Italian on an Intensive Italian language course of 20 lessons per week, which are held in small groups of no more than 10 students. Alternatively, if you want to learn as much Italian as possible during your time in Salerno, take the Super-Intensive Italian course of 30 lessons per week. 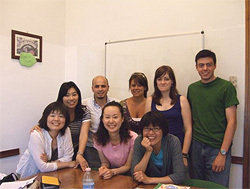 Both courses aim to improve your general Italian skills in classes of other students in a similar ability. You may wish to take a course of Private Lessons if there are specific things that you wish to focus on, or an Intensive + Private Lessons course to benefit from both group lessons and individual tuition. If you are aged 50 and above with a love of Italian culture, why not take our Club 50+ course in Salerno? This course allows you to study uniquely with other students of a similar age and combines Italian lessons with a wide variety of activities and excursions. Want to share the experience of language travel with your whole family? Our school in Salerno offers Family Courses, allowing both adults and children (7-16 years) to learn Italian in an immersive environment. Our school in Salerno also runs an Intensive + Cookery course, allowing students to experience the local gastronomy and wines of the Campania region. Experience life in a traditional Italian household by staying with a carefully selected host family on a bed and breakfast or half-board basis, where you will see your language skills improve in no time! Our school in Salerno also arranges shared apartment accommodation for students who enjoy their own independence. Shared apartments are comprised of single and double rooms, as well as shared bathroom and kitchen facilities. Choose the shared apartment plus option for a place with air conditioning and more modern facilities. If you would prefer private accommodation, you can choose to stay in a studio apartment. Our school in Salerno organises an extensive cultural program, including guided walks around Salerno, weekly dinners for students and teachers in picturesque local restaurants, cinema and theatre trips, Italian film evenings at the school, as well as discussions at the school on social and political events in Italy. There are also weekly full-day excursions to Amalfi, Positano, Cetara, Sorrento, Pompeii, as well as to other locations along the coast. 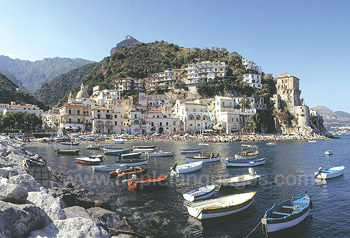 The best way to get to Salerno is to fly to Naples Airport (50 km from Salerno). From Naples, there are regular direct trains to Salerno. Alternatively, private airport transfers can be arranged at an additional fee, which will take you directly to your accommodation from Naples Airport. Average score for our school in Salerno based on 19 previous client reviews. Good teacher, but she talked a lot! Excellent activity programme whether or not you were on the 50 plus programme. Best of all the schools I have been to. Our second teacher was brilliant and it was really interesting, she has a great way of teaching. Tina was a lovely host mother and really looked after us well. Her cooking was beautiful and her grand daughter was a treasure. A very hospitable lady. A true host mother in all senses. Overall i have a very positive experience and would like to thank all at Apple Languages for their help. Annamaria was a superb teacher and we learned a lot. She is a very intelligent, sensitive person, notices immediately where to ask more, where there are holes to fill. We had a lot to laugh which I find very important. My friend and I enjoyed every minute with her and can recommend her highly. Accommodation quite ok, its Italy not home. We had everything we needed. Our stay was wonderful, the teachers were motivating and very polite, [and also] very patient and positive. We learned a lot of grammar and want to continue! There are real positive dynamics in the class. We would like to come again. 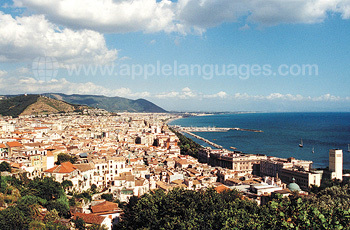 Salerno was a fantastic place to study italian. It seems that few native English speakers go there so I was thrown in at the deep end and was totally immersed in the language for the first two weeks. The school was fantastic and the teachers were so enthusiastic and cleearly loved what they do. Staying with my host was a wonderful experience, this lady is wonderfully warm and very funny and my Italian being a bit ropey at first made life with this non English speaker totally hilarous. Many hours were spent at the kitchen table in hilarious conversation and the highlight of my whole stay in Salerno was being taken out on little trips by Clara in her Fiat 126 on tour around her beloved city and down the coast. Her cooking is legendary. The course was excellent. The two teachers were brilliant and it was down to them that everything was so good. The teaching style was great, the same as the spanish courses in mexico and costa rica. The teacher was excellent. The course was very good. Our teacher was very patient. The course was excellent. The teacher was very good and had a structural and flexible approach to maximise the learning of both grammar and communication. The apartment was very good and conveniently close to the school and well located at the historical centre. The course was very good and the teachers were very friendly. My accommodation was alco very good. Everything was a great success!